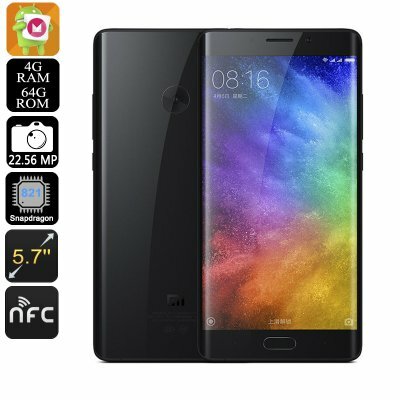 Successfully Added Xiaomi Mi Note 2 Smartphone 64GB - Snapdragon 821 CPU, Android 6.0, 22.56MP Cam, 4GB RAM, 5.7 Inch Display, NFC (Black) to your Shopping Cart. Meet the Xiaomi Mi Note 2, a high-end smartphone that packs all the specs you need to enjoy a magnificently smooth user experience. Running on a MIUI 8 operating system that has been based on Android 6.0 this Chinese smartphone delivers all the trusted features Android users are used too. On top of that this Android phone offers a bunch of its own optimization features that are sure to enhance your mobile experience even further. Coming in an ultra-thin and stylish body this Xiaomi phone surely holds the looks of a high-end smartphone. Coming with 64GB of internal storage the Xiaomi Mi Note 2 offers plenty of space for you to store all your personal files and media. This storage space will come in handy to store all your games and movies as the phone’s 5.7 Full HD display offers the perfect platform on which to enjoy a true cinematic experience. With edges that curve around the corner, this smartphone truly offers a visual experience without limits, allowing you to take your gaming and media experience to an entirely new level. Thanks to a massive 4070mAh battery and Quick Charge 3.0 technology you can now be assured that you can endlessly enjoy all your mobile entertainment as, with this smartphone, running out of juice will be a rare occurrence. Within its sleek and beautifully designed body this Chinese smartphone packs an epic Qualcomm Snapdragon 821 CPU that has been clocked at a stunning 2.35GHz. Along with 4G of RAM the Xiaomi Mi Note 2 offers a perfect platform for multitasking, playing games, and watching FHD movies. So no matter how excessive of a smartphone user you are, this Android phone is guaranteed to handle whatever you throw at it. Dual-Band Wi-Fi and 4G connectivity additionally offer you all means to enjoy ultra fast and careless online browsing. Whether you like to stream a movie online, play demanding multi-player games, or download the latest apps – with this phone’s data connectivity you are guaranteed to enjoy the fastest internet speeds available on the market. At the rear of this flagship smartphone you will find a magnificent camera that is capable of snapping breathtaking 22.56MP images. Besides that, this professional-grade camera allows you to shoot incredibly sharp 4K footage, giving you all means necessary to capture your upcoming holidays and day trips in stunning beauty. Take smartphone photography to an all new height - with the Xiaomi Mi Note 2 you’ll be able to carry along a professional-grade camera in your pocket at any time. The Xiaomi Mi Note 2 comes with a 12 months warranty, brought to you by the leader in Android smartphones as well as wholesale electronic gadgets.. Very good phone just as expected. And I really have to say Chinavasion has the best customer support I have ever dealt with.